MSNBC held a town hall with new Speaker of the House Nancy Pelosi (D-CA). One person asked the pro-abortion “Catholic” woman if she supports the black lives matter movement. Within Nancy’s long-winded response, she mentioned three words Democrats will absolutely hate. Well. 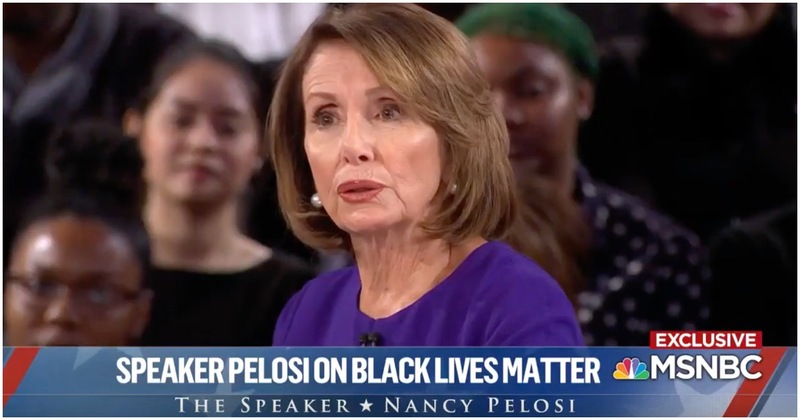 Who’da thunk Pelosi was such a racist, huh? What are the odds the media calls Nancy out on her gaffe? Hearing Nancy Pelosi use the phrase "all lives matter" makes me cringe. It's not that the words themselves aren't true, but rather that they've been used as a racist dog whistle by the right for too long. There are better ways to say this. Pelosi’s first act is forcing Americans to pay for abortions. Nancy Pelosi has a long history of promoting abortion and she will continue to push a pro-abortion agenda as the incoming Speaker of the House. Pelosi takes the gavel as Speaker for the 116th Congress today, and her priority agenda to dismantle the pro-life policies of the Trump Administration take center stage. In her first act, the Consolidated Appropriations Act of 2019, Pelosi’s price tag for ending a government shutdown includes repealing the Protecting Life in Global Health Assistance policy (formerly known as the Mexico City policy), and vastly increases taxpayer funding of the United National Population Fund (UNFPA) which is a chief contributor to China’s appalling policies of forced sterilization and coercive abortion. In essence, Pelosi wants Trump’s wall on abortion repealed while forcing Americans to finance the international abortion industry. Pelosi’s first priority as the next Speaker is to attempt to force Americans to pay for abortions and to funnel taxpayer dollars to the nation’s biggest abortion business. She wants Americans to be forced to fund Planned Parenthood and its International group’s efforts to promote and perform abortions in other countries. Remember, this is the same “Catholic” Nancy Pelosi who has been barred from receiving holy communion. On Christmas Eve, Pelosi blasted President Trump over the government shutdown. Of course, Democrats own the shutdown because they refuse to secure the border but Nancy doesn’t want you to know that. Remember, January 3 was only day one of what promises to be a wild two years. Democrats are now in charge of the House of Representatives, and Pelosi has once again been voted Speaker. Here’s the beginning of Nancy’s speech, but you can check out the full transcript at this link. Thank you, Leader McCarthy. I look forward to working with you in a bipartisan way for the good of our country, respecting the constituents who sent each of us here. I am particularly proud to be the woman Speaker of the House of this Congress, which marks 100 years of women winning the right to vote, as we serve with more than 100 women in the House of Representatives – the highest number in history. Each of us comes to this chamber strengthened by the trust of our constituents and the love of our families. We welcome all your families who are with us today. Let me thank my family: my husband Paul; our five children Nancy Corinne, Christine, Jacqueline, Paul, and Alexandra; our grandchildren, and my D’Alesandro family from Baltimore. "If we ever close the door to new Americans, our leadership role in the world will soon be lost."